If you asked someone to name a few foods that come to mind when they think of Canada, they would probably list items like maple syrup, poutine, and Canadian bacon (spoiler alert: we just call it bacon). Clamato juice might also be mentioned if they’d ever had the hair of the dog in the Great White North, or tourtiere if they’d spent a Christmas in Quebec. But if you switched the question up and asked them to name the most popular condiment that originates in Canada, I’d be willing to bet the farm (pun intended) that not one person would provide the correct answer. 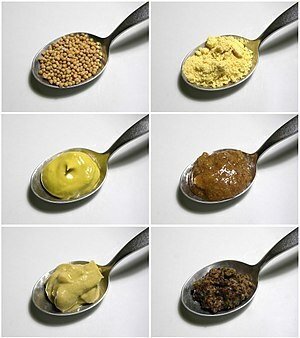 Yep, believe it or not, the correct answer is mustard. When it comes to producing mustard seed Canada doesn’t just excel, it dominates. In fact we grow between 75-90% of the global supply. Who knew?! And for any Albertans reading this, you can take a little extra pride in knowing that we harvest the most seeds (Saskatchewan takes second place). But even though Canada grows the most mustard seeds, we don’t come anywhere near to being the country that manufactures the most mustard. As with most of our natural resources, the majority of seeds are shipped elsewhere to be turned into the finished product. Now that I think about it, that’s probably why we aren’t better known for our mustard seed growing prowess. More information on mustard seed can be found by clicking here or here, and details about Canada’s mustard industry can be found here.